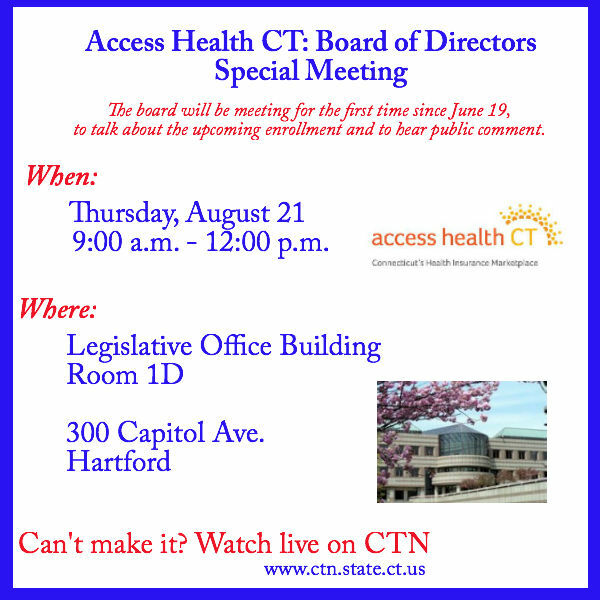 The Access Health CT (AHCT) Board of Directors will hold a special meeting tomorrow morning, beginning at 9 a.m., at the Legislative Office Building in Room 1D. The next open enrollment period begins November 15, 2014 and tomorrow’s agenda is important. The meeting includes public comment so the board can hear concerns from residents. According to AHCT’s website, this will be the first time the board has publicly met since June 19. If you’re unable to attend the meeting, you can stream it live on CTN. Be sure to follow us on Twitter and Facebook for updates and follow-up posts about AHCT and the next enrollment period.